A very easy cake to make, but it's rich and really moist. Soaking the fruit the day before the cake is made, ensures it stays plump. Place the fruit and nuts in a large bowl, stir in the orange zest and juice, Drambuie or brandy. Cover and allow to stand for at least 6 hours or preferably overnight. Preheat the oven to 150°C, gas mark 2. Line the base and sides of a 20 cm round cake tin with a double thickness of baking parchment, cut so that it stands 5cm above the edge of the tin. In a large bowl, beat the butter and sugar together until pale and fluffy. Add the eggs, one at a time, beating well between each addition. If the mixture begins to curdle, stir in a tablespoon of the flour. Spoon the mixture into the tin, ensuring there are no air pockets. Level the top. Use kitchen string to tie a double band of brown paper around the outside of the tin. Stand the tin on several sheets of newspaper or brown paper - this prevents the sides and base of the cake becoming too dry or scorched before the centre is cooked. Place in the preheated oven for 3-4 hours, until cooked. Test by inserting a skewer, if it comes out clean the cake is cooked. If the cake starts getting too brown, cover with baking parchment. Cool in the tin, turn out, then store in a cool, dark place wrapped in 2 layers of baking paper and a layer of foil for 2-3 days before icing and decorating. 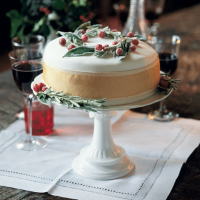 Find out how to ice and decorate your Christmas cake here.